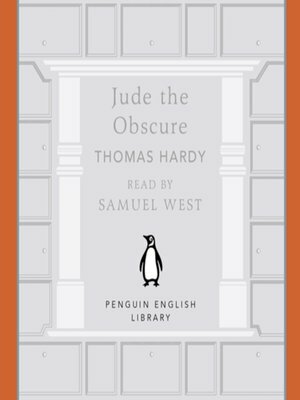 Penguin Classics presents Thomas Hardy's Jude the Obscure, adapted for audio and available as a digital download as part of the Penguin English Library series. Read by Samuel West. 'As you got older, ... you were seized with a sort of shuddering, he perceived. All around you there seemed to be something glaring, garish, rattling, and the noises and glares hit upon the little cell called your life, and shook it, and scorched it.If he could only prevent himself growing up! He did not want to be a man'Jude Fawley, the stonemason excluded not by his wits but by poverty from the world of Christminster privilege, finds fulfilment in his relationship with Sue Bridehead. Both have left earlier marriages. Ironically, when tragedy tests their union it is Sue, the modern emancipated woman, who proves unequal to the challenge. Hardy's fearless exploration of sexual and social relationships and his prophetic critique of marriage scandalised the late Victorian establishment and marked the end of his career as a novelist.Part of a series of vintage recordings taken from the Penguin Archives. Affordable, collectable, quality productions - perfect for on-the-go listening.